Hoorah! The sun is shining this Saturday after a very wet week. I think it rained for over 24 hours at one point – at least it certainly felt like it. Anyway, here is what is going on outside this Saturday. Each year, these irises pop up, with their glorious purple colour. Some of the current blooms got a bit battered by the bad weather earlier in the week, but this one survived relatively unscathed. With the sun out, I thought I would get seed planting…and then discovered that I had no potting compost left, or rather, only a little to fill two small pots and get some marigolds started. I also could not find the seed tray, which seems to have hidden itself somewhere. Total failure! I was checking the back of the house, not only to see what had been happening, but also to see if there was any damage, even slight, following the stormy weather. All I could spot was this fern, which is now beginning to touch the roof. Makes a nice canopy of course, but it will need to be cut back a bit. Also around the back, I found these grass fronds, which just look so pretty in the sunlight. The ground underneath two of the trees at the back is covered with this plant with the pretty green and white leaf. I have failed to identify it, so any suggestions gratefully received. I think it might be Bishop’s Weed? 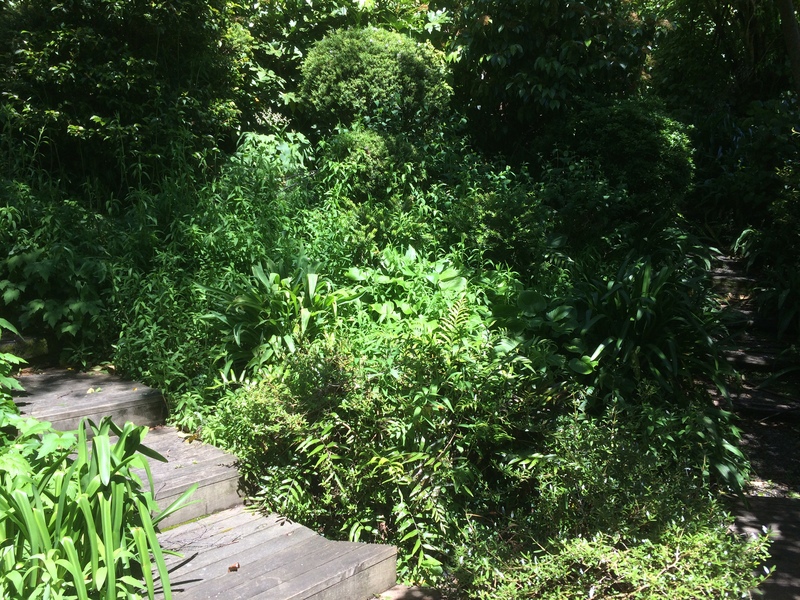 Here you see the other steps to our house, and why we don’t have a formal garden! Thanks to The Propagator for starting Six on Saturday. It is a lovely weekend treat! As your cutting your fern back I’m busy wrapping and trying to protect my tree fern. Looking a bit pitiful currently, but hopefully get it to pick up next year. Nice to see yours. This time of year the ferns really begin to grow rapidly. Lovely, but can be a little bit of a nuisance as well! So lush, so mysterious! I’m curious – we’re just across the Ditch from you, here in Tasmania. Do you get snakes in such lushness? If it were Sydney, it’d be funnelweb spiders!!! No snakes in New Zealand! There are weta, though they tend to stay hidden. It is very green where we are. You have a lovely lush garden. I think the mystery leaves look similar to our ‘Dead Nettle’ Lamium maculatum – maybe take a photo when / if it flowers. Thanks! And thanks for the tip too. Will keep my eyes on it. That bishops weed seems to grow anywhere, it’s a bit like wandering jew – same thing and the bane of every gardener. Luckily it seems to be confined to one corner…at the moment! Your weed is Lamium galeobdolon, which we usually call yellow archangel when we’re being polite. It’s not native to the UK either and I fight a constant battle with it which I doubt I shall ever win. It’s an invasive menace, you really don’t want it, no matter how pretty. At the moment it is confined to one area. Sounds like a job for my to do list to get rid of it! Everything is so lush! Did you ever find your planting gear? I ended up buying a new seed tray…and of course found the old one then…. Ah, too funny. You’ll be doubly prepared next time.